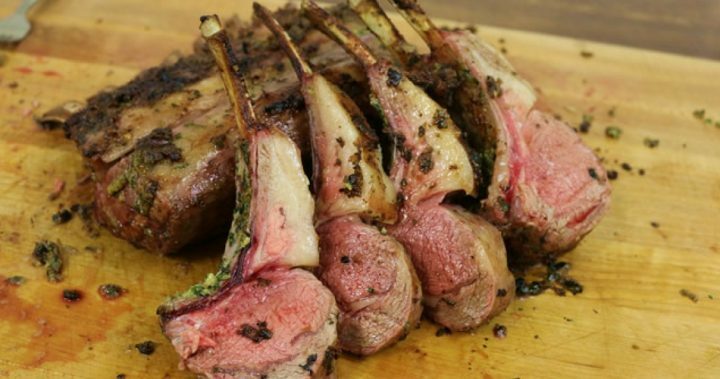 Impress your guests with this sumptuous grilled rack of lamb! Barbecue pro Malcom Reed from HowToBBQRight.com was kind enough to share his mouth-watering and decadent Grilled Rack of Lamb recipe with us. Malcom’s recipe uses two racks of lamb, each weighing about 1.5 lbs. The loins are mostly trimmed (you’ll want to leave some fat for flavor) and the bones are frenched, which means that about 2″ of the meat has been removed to show the tip of the bone, so you don’t have to do anything else to prep the meat. Remove each rack of lamb from the packaging and pat off any excess moisture with a paper towel. Lay the racks out on a work surface or large platter and generously season the outside with Killer Hogs AP rub. You can also substitute kosher salt and cracked black pepper. Next, you’ll add another layer of flavor using a “wet rub” – a combination of fresh herbs, garlic & shallot with a touch of mustard and olive oil as the binder. Killer Hogs AP Rub can be substituted to add even more flavor. 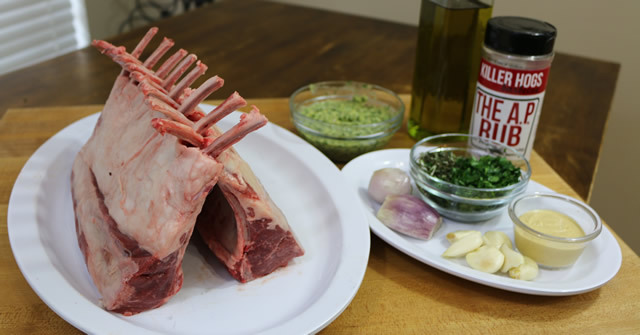 Generously coat the outside of each rack of lamb with kosher salt and black pepper or Killer Hogs AP seasoning. Roughly chop the parsley, rosemary, thyme, garlic, & shallot. Add to food processor. 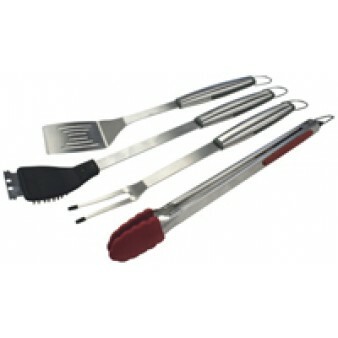 Start grill and bring temperature to 425?F. Add 1 chunk of cherry wood for light smoke. Place lamb on cooking grate, bone side down, for 4 minutes. Flip each rack and cook for additional 4 minutes. Remove lamb from grill or move to cool zone. 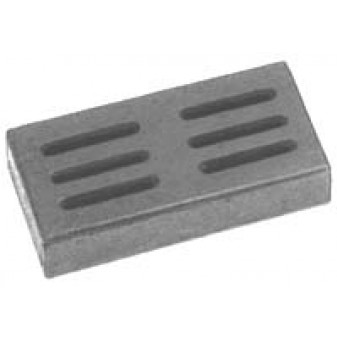 Reduce grill temperature to 325?F. Place lamb back on the grill, standing vertical with bones interlocked, and continue cooking over indirect heat. 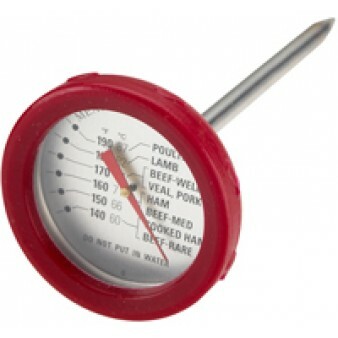 Insert probe thermometer in the center of meat, set for 128?F. When alarm sounds, remove lamb from grill and let rest for 10 minutes before serving.